I think for oversight, ya'll need some type of androgynous P.C. super-cop, with a great big ticket pad and some type of wheel-boot gear for differently-abling Python vehicles. Though I dunno how that would work on the H.I.S.S. tank - YA'LL figure it out. 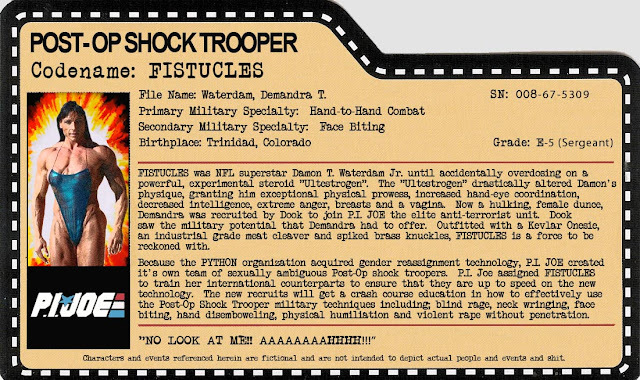 This character's primary back-up role would be to defend Fistucles and the other squad members, from any degrading or inflammatory comments, even if they're only half muttered under one's breath - so obviously some type or audio surveillance equipment or better yet "enhanced PSYCHE skills" (perhaps with a numerology/astrology slant to it?) would be essential kit. This character might be deemed as the team's "intel" OR possibly even "heavy weapons" component. And then of course you need the action vehicles, though obviously with an agro GREEN slant. Like a pedal-powered up-armoured HUMVEE, or better yet a pedal-powered aircraft of some sort, which doubles as a see-through action figure collection display case?